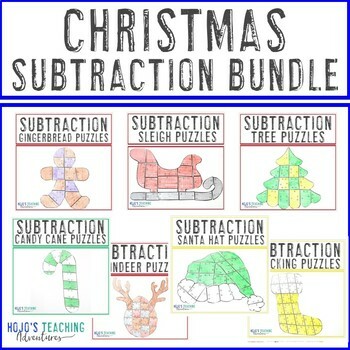 SUBTRACTION Christmas Math Games - SEVEN Puzzles in One Download! If you've been looking for a way to save money AND have some Christmas Math Worksheet Alternatives FUN, this is the download for you. You'll get SEVEN of my Christmas math puzzles - gingerbread, sleigh, Christmas tree, candy cane, reindeer, Santa hat, and stocking. These are sure to be a hit with your 1st, 2nd, and 3rd grade students. Want a notification each time I post a new resource? Follow my TpT store by clicking here.